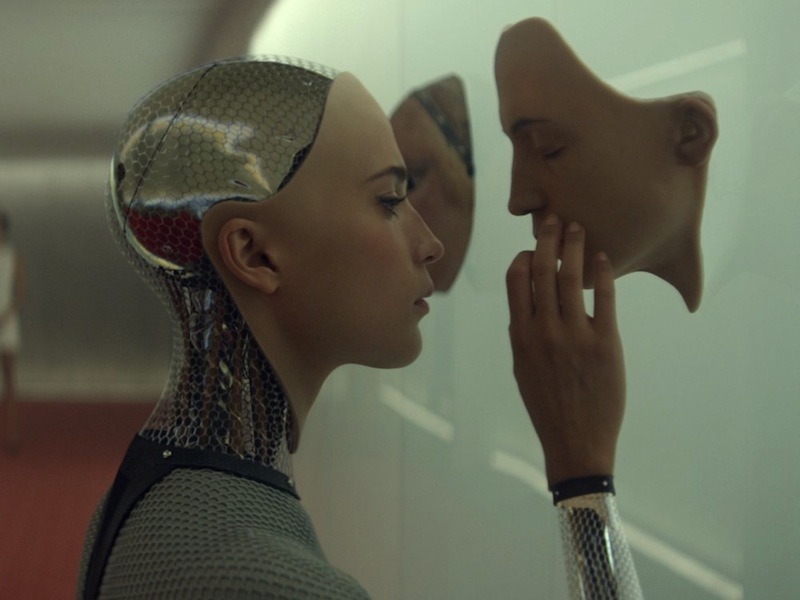 Screenwriter Alex Garland (28 Days Later, Never Let Me Go) takes over for the first time as director in the science fiction thriller Ex Machina, an atmospheric and engaging take on the future of artificial intelligence and man’s place in the ongoing advancement of technology. It tells an intimate story, mainly involving three characters, that appropriately finds a chilling balance between humanity and inhumanity. The film also breaches heavy concepts like mortality and collective consciousness without getting too heavy-handed or over-explaining, instead trusting the audience to think for themselves and dwell on the themes at hand. We begin at fictional search engine company Bluebook, a dual homage to both Google and Facebook, where a young programmer named Caleb (Domhnall Gleeson) is selected to meet with the company’s reclusive CEO Nathan Bateman (Oscar Isaac) for a week-long research project. When Caleb arrives, he is shocked to find that Nathan has developed a near-fully functioning form of artificial intelligence that is being carried out through a humanoid robot named Ava (Alicia Vikander). For the next seven days, Caleb puts Ava through an intense psychological Turing test in order to push the technology further and create the most sophisticated AI in history. Thematically, the film’s most innovative material comes from its view of gender and the misogynistic undertones that permeate Caleb and Nathan’s relationship with Ava. Though they are both clearly brilliant men, they seem to both possess a weakening ability to deal with women or more specifically, their own manifestation of a woman. From Nathan’s seemingly casual abuse of the female-like robots to Caleb’s initial patronizing treatment of Ava during their interactions, it’s ironic that Ava seems to display a higher degree of emotional intelligence than either of the men with whom she interacts. More than anything, Ex Machina does a stunning job of reminding us what is means to truly be a human being. We learn late in the film that Ava’s brain is actually a composite of the billions of search queries submitted through Bluebook, along with other illegally obtained personal data like text messages and cell phone videos. This creates surprisingly effective results and is a fresh approach to building an AI but even with all of this stimuli of human interaction and experience, there is still a component of humanity that Ava struggles to recreate. All of this is carried out with a crisp production design and seamless computer generated effects that are integrated with careful detail and nuance. The chilly score by Geoff Barrow and Ben Salisbury also adds an extra layer of depth without drawing too much attention to itself. The performances, especially from Vikander, are well-realized and full of believability, although I still don’t fully find myself on the Domhnall Gleeson bandwagon as of yet. Ex Machina intelligently handles the typical themes found in science fiction films and has enough new ideas to make it a worthy addition.